I have a huge passion and obsession with colour. In my continual pusuit of all things beautiful I find it in the balance between hues of vibrant colour. Strong colours are a condensed force and help heighten the mood and have a direct impact on feelings and emotions. I am constantly in motion and the tapestry of life, travel and new cultures is where I gather my inspiration in abundance.I have a passion for the face and expression and abstract portraits have become second nature to me. 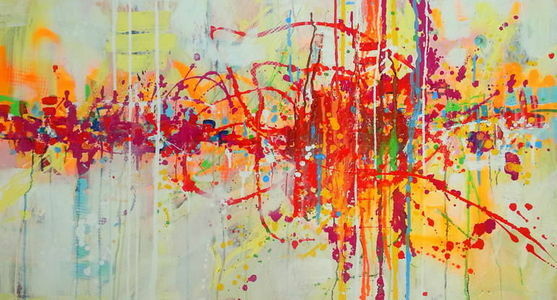 I express myself on canvas, using strong, long lasting dyes which allow me to capture the dynamics of life. My love of fluorescent colours is captured in my passion also for light. I delight at the glow under 'ultraviolet light' that has the power to magically breathe new life into each of my works giving a new dimension entirely. I love using sunny hues that illuminate and radiate my work bringing a warmth and glow to each and every piece that I create. Color is what matters and conveys my message perfectly. The process of painting, for me, is spontaneous, with no prior sketches nor plans. I avoid over-intellectualisation in my work and let my subconscious self guide the brush until a perfect beauty emerges. Marta _______________________ Marta Zawadzka (born 1981, Bialystok, Poland, 2000-2005- Faculty of Architecture and Urban Planning- Technical University) Currently lives and works in Warsaw. An inspirational artist whose background and study in architecture and design translates into a dynamic canvas. Marta uses vibrant colour combined with technique to create artistic masterpieces. Her work conveys movement and flow, dancing on the canvas in the form of iconic past masters. Flourescent paint, acrylics and spray paints bring to life icons from the world of art, sport, film, music as well as inspirational leaders of our time. Highly desirable, Marta travel's the world inspiring new markets with her art delivering a colourful message to all continents. With each concept and brush stroke her work is embraced with equal delight and fervour internationally. [nbsp] Marta's masterpieces are hugely accessible and continue to leave a lasting warmth on the walls of collectors. She has been featured on prestige Saatchi Art list -"ON THE RISE- 25 Emerging Artists from Eastern Europe" and her paintings are published in catalogs and collections Saatchi Art. 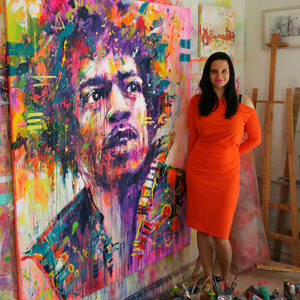 She has worked with mega brands such as Samsung, Grolsch, Ikea and Chanel and has acquired recognised clients from all over the globe such as Slash from Guns N' Roses, also Lewis Hamilton has drawn attention to her paintings too. She had exhibitions during Grand Prixs Formula One in Mexico, Monaco and Singapore Her works can be seen in galleries, exhibitions in the UK, USA, Monaco, Holland, Singapore,Philippines, Belgium, Mexico, France, Germany, Dubai, Australia, Canada and Poland. Grolsch 400-year anniversary, massive event, workshop and exhibition with artists from around the world.